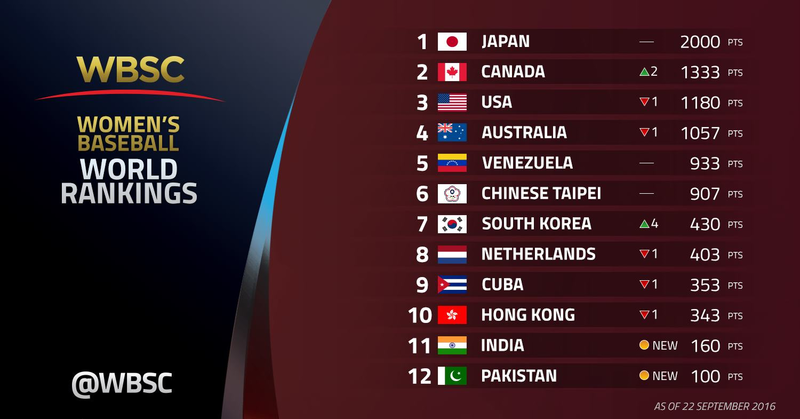 LAUSANNE, Switzerland -- The World Baseball Softball Confederation today revealed the updated standings in the Official WBSC Women's Baseball World Rankings 2016. The newly updated rankings reflect the final standings and over 100 international matches of the Women's Baseball World Cup®, dating back to 2012. Five-time defending world champions Japan -- winners of the recent LG Presents WBSC Women's Baseball World Cup 2016 in Gijang, Republic of Korea -- have extended the nation's lead from 400 points to 677 points over the second-ranked country due to an unprecedented win-streak of 21 games in World Cup competition. Japan is also ranked No. 1 in both the Men's Baseball and Women's Softball world rankings. Canada jumped two spots to No. 2 in the world. The move represents a historical high in the rankings for the Women's Baseball World Cup 2016 silver medallists. The United States dropped to No. 3 in the world, following a 7th Place finish at the world championship in Gijang, which represented the first time in history that the U.S. Women's National Team did not earn a medal in the women's pinnacle event. After capturing the bronze medal of the Women's Baseball World Cup 2016, No. 5 Venezuela has moved within striking range of overtaking the U.S. and No. 4 Australia, coming within 124 points of Australia and 247 points of USA. Chinese Taipei, following the nation's best-ever/4th Place World Cup finish in Gijang, like Venezuela, has significantly narrowed the gap between the No. 3 and No. 6 nations in the world, with only 26 points separating Venezuela and Chinese Taipei. Korea made the biggest jump forward in women's baseball, advancing four positions to a historical high of No. 7 in the world, following a record 6th Place finish in Gijang for the nation. Newcomers India and Pakistan debut in the rankings at No. 11 and No. 12 in the world.